Soufflé not rising? Homebrew beer not bubbly? Bees … suffering Colony Collapse Disorder? There may be an app for everything these days, but guaranteed, there are patron saints for more—including disasters of the food-and-drink-related variety. So rather than turning to your iPhone for practical intercession, how about turning to the patron saint of baking or beer-making or beekeeping for divine intervention? Saint Anthony the Abbott is technically a patron saint of butchers, but since there are so many patron saints of butchers—including the apostles John, Bartholomew, Andrew, and Peter—Anthony can afford to specialize in bacon. He was a 4th century ascetic who lived for 20 years in an abandoned fort, only occasionally performing miracles and healing people who broke in on his solitude. He is frequently depicted with pigs, possibly owing to his use of pig fat in his healing concoctions, so he was adopted by pig butchers as their patron saint—meaning that if you’re craving the crispy, smoky flavor of good bacon, Anthony is the man you want to talk to. Saint Drogo, born the son of a Flemish nobleman in 1105 in Flanders, was the original multi-tasker—he could reportedly “bilocate” and was seen simultaneously working in the fields and going to Mass on Sundays. This undoubtedly took a lot of energy, which is probably one of the reasons why he is the patron saint of coffee and coffeehouses (as well as ugly people and cattle). Having bread troubles? You’ve got two saints to call on: Saint Elizabeth of Hungary, a princess born in 1205 who rejected courtly life in order to distribute bread to the poor, and Saint Nicholas—yep, that Saint Nick, the jolly fat man with the belly like a bowl full of jelly. Nicholas was a 4th century bishop who rescued three poor women from a life of prostitution by tossing bags of gold through their window at night; he’s also the patron saint of children, pawnbrokers, and Greece. If you’re having trouble with your beer—whether you're suffering a homebrew disaster or the waitress is taking too long to bring your pint—then you’ve got three different saints to whom you could appeal. There’s Saint Nicholas, mentioned above; Saint Luke, author of the third Gospel and considered the first Christian physician; and Saint Augustine of Hippo (top). 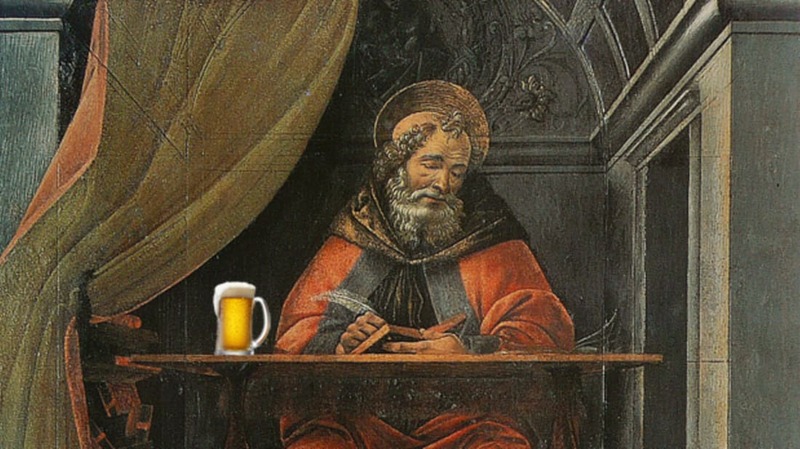 Augustine, who lived in the early 5th century, had a boozy, wantonly licentious lifestyle; he earned saint status after giving up his wanton ways, and became the patron saint of beer sometime after. Saint Vincent of Saragossa died so that we could have good wine. Well, not exactly: The 3rd century Spanish martyr died for his faith, after some serious torture involving iron hooks and being roasted on a red-hot gridiron. But since his death, he’s become the patron saint of wine and wine-makers. So thank you, Saint Vincent. And thank you, Saint Urban, another patron saint of wine. He was the bishop of Langres in France during the 4th century, but found himself on the receiving end of some persecution after the political situation got murky. He hid in a vineyard, and took the opportunity to convert the vineyard workers who concealed him; he went from vineyard to vineyard thereafter, spreading the Gospel. If, unlike Augustine, you’re not quite ready to give up your inebriate ways, then you may want to keep a prayer to Saint Bibiana, patron saint of hangovers, on your lips. Little is known about the 4th century virgin and martyr, except that she was reportedly both a virgin and a martyr—she was, according to legend, tied to a pillar on the orders of the Governor of Rome and beaten to death after she refused to convert or be seduced. Why she’s the patron saint of hangovers, as well as headaches, the mentally ill, and single women, is totally unclear. Tired of having hangovers all the time? The first step might be to admit you have a problem (beer for breakfast might be an indication). The second step might be to reach out to Saint Monica. She was the mother of wild, drunken St. Augustine and she earned her saintly status by spending 17 years praying for him. She’s the patron saint of alcoholics. But back to cheerier topics, like tiny saints and fish. St. Neot, a Glastonbury, England monk who died in 877, is the patron saint of fish. He was also reportedly only 15 inches tall and spent his days in a well, water up to his neck, practicing his devotions. Before you get down to cooking, you probably want make sure that your local grocery store has all the ingredients you need. For that, you can appeal to Michael the Archangel, one of the stars of the Old Testament. Some claim that grocers adopted Michael as their patron saint because he was also the patron saint of law enforcement officials, who protected the grocers’ business. But how about the people who grow the food that turned up at market? For that, you’ll want Saint Isidore the Farmer who was, well, a farmer and whose plowing was often accomplished with the help of three angels. If you’re on the look out for some really good cheese to pair with a fine wine (thank you, Saint Vincent), have a quick chat with 5th century Saint Brigid of Kildare, one of Ireland’s big three: Before giving her life over to virginity and Christian piety, she’d made a success of the dairy owned by the Druid landowner who’d bought her from her mother. And finally, offer a prayer of thanks to Saint Ambrose, patron saint of bee-keepers, for keeping the natural world buzzing, because without bees, life would lack sweetness (and economic, agricultural stability). Ambrose, who lived in Rome and Milan in the 4th century, earned his patronage from his nickname, the Honey Tongued Doctor, owing to his eloquent speaking and preaching. Or maybe, you’ll just go out to eat. At which point, your waiter or waitress may just offer a quick prayer to Saint Martha. Martha, the patron saint of wait staff and housewives (who sometimes feel like wait staff, without the tips), frequently hosted Jesus and his Apostles at dinner. But one day, she became irritated that her sister, Mary, wasn’t helping serve and was instead sitting and listening to Jesus. Jesus admonished Martha by noting that all her serving was distracting her from hearing his message. Martha learned her lesson and next time he came around, she stopped what she was doing to be with him. She became the patron saint of those who serve, especially food. You’ve come down with food poisoning, it happens. Who are you going to call? Saint Charles Borromeo was a 16th century cardinal who dedicated his life to helping the poor and sick; exactly why he’s associated with stomach ailments is unclear, but he is. Saint Timothy, a 1st century early Christian who was stoned to death, is also the patron saint against intestinal disorders, although again for reasons occluded by time. And then there’s wild Saint Brice, a 5th century priest who was at first better known for his wicked ways, but whose genuine conversion earned him a place in the canon; he’s another patron saint of tummy troubles, also for unknown reasons. Saint Blaise once rescued a child from choking to death on a fishbone, so he’s the patron saint of throat ailments (choking would be one); he also once convinced a wolf to return a pig he’d stolen from a poor woman. Handy guy to have around. There are more saints than there are days of the year to celebrate them, sure, but a surprising number of things don’t have a patron saint—like chocolate, for example, or tea. What would you like to see a patron saint of?